Optimist Cascade is located in Greensville by Optimist Park. It is on a small ravine that runs from Harvest Road at Wesite Avenue to the Spencer Creek. Its height is 16 feet (5 metres) and its width is 6 feet (1.8 metres). Its GPS coordinates are 17T 0582163 4792207. Optimist Cascade was discovered in November 2008 by Phil Armishaw. 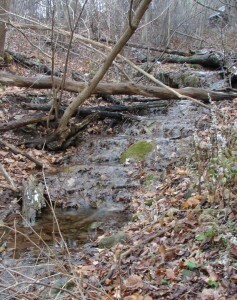 It was referred to as Optimist Cascade because the bottom section is visible from the Optimist walking trail located on the south side of Spencer Creek. It is a very interesting cascade with lots of mineral deposits on the rocks and anything else thats been in the flow for very long. One dead tree branch is covered in deposits and has become part of the falls permanently. 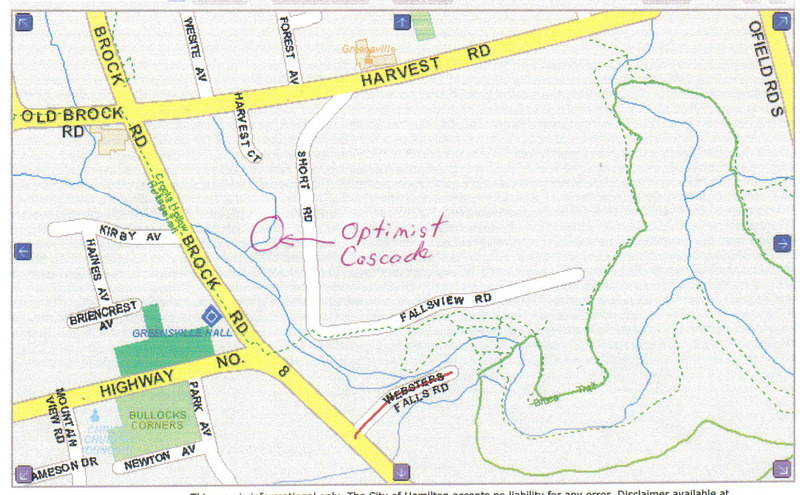 The Optimist Trail begins at the Optimist Parking lot located on Brock Road, and runs northward towards Spencer Creek. Access to the waterfall is difficult because there is no trail to it on the north side of Spencer Creek where the Optimist bridge crosses Spencer Creek. Instead the Optimist Trail goes westward while Optimist Cascade is located about 60 metres to the east.